the nytpicker: NYT's John Harwood: One Out Of Nine Earthlings Visited nytimes.com Last Month! NYT's John Harwood: One Out Of Nine Earthlings Visited nytimes.com Last Month! On MSNBC's "Morning Joe" this morning, Times reporter John Harwood took proper issue with host Joe Scarborough's skepticism about the future of the Times. 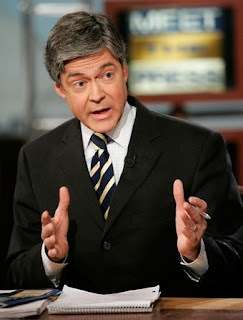 "The New York Times isn't going away," Harwood told the host. The New York Times isn't going anywhere, you're exactly right. But the New York Times of 2010 isn't going to look like the New York Times of 2000. I'm not picking on the Times. It's about every paper. And my concern is, they have to cut back. We all have to cut back. But reporters get cut and when reporters get cut there's less of the investigation powers. Good point. But Harwood would not be deterred in his defense of his employer. "I have no argument with what you're saying," Harwood said. "However, in the month of October, 750 million people visited the New York Times website, okay?" "Wow!" said Scarborough's co-host, Mika Brzezinski. "There's a business in there," Harwood noted. Harwood's right. There's definitely a business in any website that gets 750 million unique visitors a month. But it's possible Harwood may not be up on the latest world population statistics. At the moment, nearly seven billion people live on the planet Earth. That would mean, by Harwood's numbers, that one out of every nine Earthlings checked out the Times website last month. Chances are Harwood meant to refer to the number of page views last month, a statistic that differs substantially in meaning from unique users. By way of illustrating the difference, Nytpicker fells compelled to confess that we are responsible for approximately 2 million of last month's page views. Which, even by Harwood's liberal estimates, leaves only 748 million people unaccounted for. Sorry, John! If it makes you feel any better, we don't want the Times to go away, either. Thanks for writing, John. You are one classy Earthling.